Every developer of any level is familiar with “bugs,” the issues or glitches in their projects. Dealing with this kind of problem is a natural part of building a website or a mobile application, and this is something that developers cannot avoid. In fact, many of them embrace this kind of problem because they know that if they fix the bugs, they improve the project and maybe learn something new. However, it is not that simple. The process of building apps and websites is difficult on its own, how much more when you come to the point of unexpected problems cropping up, and having to find the source of all this. For complicated code, it is impossible to find the bugs manually. You have to rely on tools and other collaborators to help find and fix the bugs. With any of the following bug-tracking tools, teams of developers can easily track bugs, fix the issues, and create a single platform where they can manage any problems related to the development process and codes. With that, here is our list of 12 bug-tracking tools that we believe does the job right. 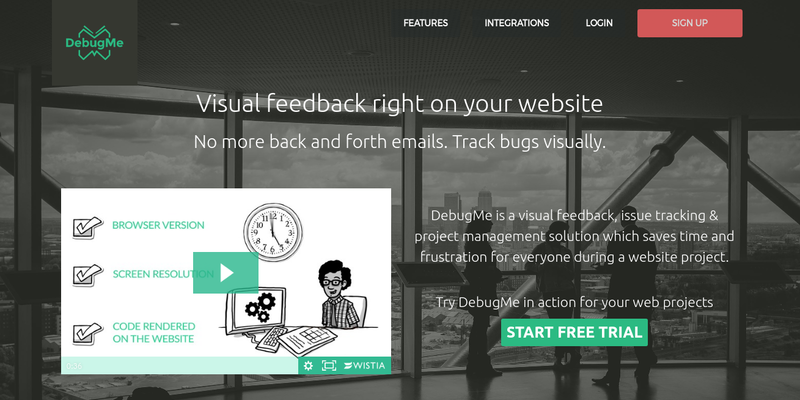 DebugMe is a visual bug tracker that eliminates the need to send emails back and forth as a way of tracking bugs and program issues. This bug-tracking tool has an intuitive interface that allows the developer to add annotations to their web project, and report bugs and issues to their team members. In addition, developers can use the toolbar to easily annotate the page by drawing within the interface, highlighting certain areas, marking specific lines of code, or even dropping a pin. The browser extension of DebugMe allows embedding code in the meta-tag of the site—this means that the bug tracking is integrated into the site, so visitors can provide feedback as well. DebugMe can be integrated with a wide range of tools, including Jira, Trello, Pivotal Tracker, or Visual Studio, which makes it ideal for small teams in terms of project management. Their paid plans start at $10/month, but they have a free plan available as well. DoneDone is a simple bug-tracking platform that focuses on simplifying the workflow of tracking bugs and issues. Team members are assigned to different tasks and roles, such as tester, fixer, and others relevant to the project, all to tackle issues and problems more systematically. All the activities are grouped into a central issue hub so each team member can spend less time switching around to view the status of each task and check what task is pending for various members. DoneDone allows the coders to be updated real-time whenever there are new bugs to work on, or there are new updates that have been introduced to the project. It also is configured so that the customers can send feedback to the developers via email. What’s great about this is that the feedback coming from the customer directly reaches the team without any third-party software. This will help the team stays on top of things in real time. DoneDone also has an integration for Basecamp, HipChat, GitHub, and other tools across the web. It can also be customized to sync with actions on Git that releases across the team. Their paid plan is priced at $39/month with 10GB of storage free. FogBugz is considered by most developers as an all-in-one bug-tracking platform. It puts together several tools in one platform, such as bug- and issues-tracking management, project planning using the Agile method, general project planning, a help desk and customer service platform, efficient time-tracking software, a Wikipedia page, and a discussion group interface. That’s a lot of tools for the price of one. FogBugz has built-in search engine tool that lets developers quickly scan their project to find existing bugs and issues or a particular code that you want to review once more. It also has a social notification that lets the team members working on the same project be updated on what’s going on with their assigned task. They can also create visual boards where they can track the project timeline and see how the issues are being handled. The reporting intuitive algorithm of FogBugz is also a very helpful feature. It can monitor the performance of the team and do predictive analysis on whether each team member can meet a particular deadline for any of their projects. This tool also allows them to revert any changes and create backlogs for future reference. It is a rich bug-tracking platform for serious and fully loaded developers. Lean Testing is a bug-tracking software that tracks bugs as they appear. This will help you quickly notice issues and create solutions for each of the bugs you find. You can then assign your team members to a different task and have them work to get it fixed right away. All the existing bugs you have collected will be put together on a single dashboard. This allows new team members to quickly catch up with where you are. This tool also has a built-in browser extension that will add a simple call-to-action button to your browser that you can click anytime when you experience a bug or issue directly with your application, website, or even the tracking platform itself. It has intuitive touch added so you can easily identify bugs that are current, bugs that have been solved, and bugs that are yet to uncover. Lean Testing also enables you to create a different level of access and create user accounts with unique permissions so that each of your team members knows what their assigned task is. Each team member will receive unique email notifications regarding any updates to their project. The best part? Lean Testing has an engine for doing direct testing for web browsers and mobile apps, which means that if there any bugs present that need to be double checked, you can directly do that from the same tool you are using. However, this tool has only limited third-party app integrations. Speaking of integrations, Usersnap is probably the tool that offers more integrations than any other bug-tracking tool. It integrates with the usual project management tools such as JIRA, Slack, Trello, Zendesk, and Intercom, and integrates with site builder tools such as WordPress, Joomla, and Drupal. It also integrates with other tools like Magneto, Evernote, and a lot more. The only disadvantage of this tool is that its price for 10 users is a little bit higher than most trackers, starting at $69/month. TrackDuck, which is now part of InVision’s wide range of tools, is a visual bug-tracking tool that integrates directly into your website pages and can be used as a code snippet. It has a browser extension that is available for Safari, Chrome, and Firefox. TrackDuck allows you to create different roles based on a level of permission on the project. Team members can be added as collaborators based on the role given to them. These roles are administrator, contributor, and reporter. It also ensures that all issues have in-depth details of the reported bug, including screenshots, snapshots, comments, marking, and “direct” highlighting (over the issue on the website itself). With TrackDuck, clients and customers can easily provide feedback directly from the website—they can click on any part of the page and leave a comment right then and there. This tool also offers integrations with many other popular tools such as Trello, JIRA, GitHub, Slack, Asana, JIRA, and other leading web tech software. It also integrates with CMS plugins including WordPress, MODX, Shopify, and Squarespace. Although TrackDuck doesn’t have any free plan, they have a free trial, and their basic paid plan is priced at $9/month for two projects. Not so bad after all. While the other tools use a more complex and sophisticated way of tracking bugs, Lighthouse, on the other hand, uses a more common design approach to ticketing and bug-tracking systems. It is an online-based, issue-management and tracking software, built with a well-refined help desk system—a platform for teams of any size to fix all the bugs. It also helps the team monitor the incremental growth of their project. This tool incorporates a tagging system that makes the bug hunting more organized. Each team member can track and fix the bugs in their department only. It also makes use of email functionality, allowing teams to work on bugs through email and have all the activities and responses recorded in Lighthouse itself. Lighthouse is also fully customizable through the use of the Lighthouse API, but it can also be integrated with simple developer software, too. This tool also supports file uploads, so you can upload code and visuals directly into the platform and you can put it all together on the same dashboard where you manage the bugs and issues. Lighthouse can be plugged into external tools and apps like GitHub and native integration with Beanstalk, Airbrake, and others that would make the bug management easier and faster. YouTrack is an issue tracker and management platform designed for intensive developer teams. It has a built-in search engine that functions the same way you write code, so developers can easily find and pinpoint bugs and code errors within a few clicks. This tool also offers a lot of ways for developers to track and report issues and have it discussed with their fellow team members quickly—finding a quick solution is important in the process of product growth. YouTrack also has a time-saver feature called the Command Window that can speed up issue modification. The natural language-like commands similar to search queries can be used to modify the attributes of an issue or a set of issues. What’s best about this tool is that it has lots of handy keyboard shortcuts to easily navigate the software. Using the keyboard shortcut, developers can easily access the issues list, expand and collapse issues, edit issues online, expand the issue summary, and show more details. This will allow developers to work comfortably with issues without exerting too much effort or eating up a huge amount of time. GitHub is the world’s most renowned open-source code-sharing platform, but it is also one of the best bug-tracking and project-fixing software. Many developers use this tool to help them track issues in their project by getting help from other friendly and generous developers. While GitHub is mostly known for its free functionality, it does, however, work with private businesses and enterprises as well. The open space of this tool creates a way for developers and designers to share their codes, which is also a great way for other developers to see their approaches to tackling different technology issues. Anyone is welcome to create an account for free and share their projects. The best part is that any changes you make will be logged and accessed throughout your development progress, making it easier for you to track bugs and issues. But it does not stop there. Another awesome feature of GitHub is that it has a feature similar to Twitter mentions, where you can ping developers to come and help you with a particular problem. Also. GitHub users can integrate tools like Slack, Gitter, Cloud9, Codeship, Waffle, and countless other developer tools into their workflow and their working project effortlessly. JIRA Software is both a planning and tracking platform, but its core functionality is to act as a management software for projects, issues, bugs, and workflows, packed together in a single dashboard. JIRA Software provides a platform where a team can come together, discuss the potential issue or bugs, and work together to solve the particular problem. Many developers use JIRA Software as a tool for building and maintaining the best software on the market, as it has impressive features such as in-built “Kanban” boards (a workflow visualization tool like sticky notes on a whiteboard) for tracking cycle lifetime, concise scrum boards for agile teams, native mobile apps to support ongoing progress, and thousands of add-ons to increase the functionality of this software and for your project as well. JIRA Software also integrates with Zendesk, Git, Salesforce, Microsoft’s Dynamics, and of course Atlassian. It can also be used to integrate with all the tools that your team is already using by configuring its set of APIs. The Custom Query Language of JIRA is also a very useful tool as it is used for filtering out content from the whole of a database. JIRA Software has two pricing plans: $10 for small teams, and $75 for growing businesses. Request Tracker, commonly called RT, is a support ticket platform for bugs and support issues. It is also used for help desk questions and security relations. RT manages and organizes requests sent by members of the team. Emails sent to a specific address is received in the request tracker. All of the emails stored on RT can be accessed by everyone on the team, who also have access to manage the tickets and projects, allowing them to close the ticket if necessary. RT incorporates autoresponders, which makes managing tickets more effective. With this, users know that their email is acknowledged; all they have to do is wait for the project leader’s reply. This tool also allows you to create custom scripts so that the managing of tickets and requests will be on the same dashboard, and anyone with permission can access and manage them. This ensures that the team and customers have the highest engagement. Other features of RT include time tracking and task prioritization, a search engine that allows you to find data or a snippet of your project, and an extensive API that you can plug into any external application. Sifter aims to make bug tracking simpler and more convenient for nontechnical teams, making this tool one step ahead of all the bug-tracking tools listed here. With Sifter, all the issues can be logged via a form or even email. This will be saved and indexed in a database, which is searchable and sorted according to project milestones. Apart from that, you and your team can also enjoy great budget savings with this tool. Not only that, your team will also have a flowing system for concluding bug testing, a very effective way of analyzing your code based on in-depth understanding of where more bugs could arise. Your team can also enjoy clear communication between people, including project managers, members, and even clients who are involved in the project. The only problem is that Sifter does not take screenshots and snapshots of the issues. But, the ease of logging issues and keeping your team up to date allows Sifter to perform better than any other bug-tracking tool, making it better suited to smaller teams. Their paid plan starts at $29/month, but you can enjoy a 14-day trial with no obligations and no credit card required.